For Medical / veterinary items and equipment which do not pose a risk of infection including gowns, plaster casts and outer dressings. For Hygiene waste and sanitary protection items such as nappies and incontinence pads Autoclaved laboratory waste. 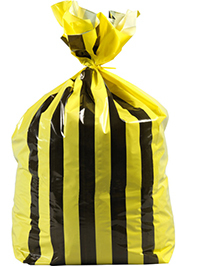 GV Health yellow and black tiger-stripe bags are used for disposal of non-infectious but offensive hygiene waste. Offensive/hygiene waste should be processed by licensed facilities capable of safe handling and disposal but is not classified as "dangerous in carriage". Clinical waste disposed through this channel can be sent to landfill and does not require specialist disposal. More and more Healthcare establishments and County Councils are using tiger stripe as a universal waste stream to save money and make it simpler for the general public to differentiate what can be placed in the bag.